c. The column-krater surfaced at Sotheby's (London) in 1987 and then passed to the Royal-Athena Galleries, featuring in the catalogues for 1991 and 2006.
d-f. The three bronzes are reported by the Italian authorities to have been stolen from Italian collections in 1970, 1971 and 1975. I do not know when the Royal-Athena Galleries acquired them (though they are said to have been sold to a North American collector during the 1980s). I do not know when the Royal-Athena Galleries acquired the other two pieces. However some of the pieces were in the possession of Royal-Athena Galleries after 1991 and the creation of the Art Loss Register. The column-crater (Beazley Archive no. 19523), for instance, featured in a 2006 catalogue (Art of the Ancient World vol. 17). Eisenberg told me [sc. Rosenbaum] that he had sold the bronzes in the 1980s to collector John Kluge, who put them up for auction at Christie's on June 8, 2004. Eisenberg repurchased them there (for $6,573 and $9,560, respectively). He said that he had also voluntarily returned other pieces, when he learned that they had been illegally taken from Italy. 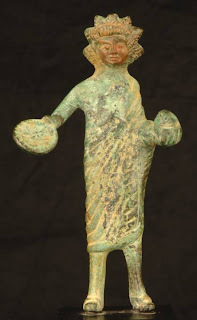 Did the Royal-Athena Galleries consult the ALR database once the bronzes had been re-acquired? Or was the fact that they had owned the pieces back in the 1970s or 1980s deemed to be sufficient? Or had Christie's run a check on the bronzes prior to the 2004 sale? I have commented elsewhere on the use and limitations of the ALR ("The Art Loss Register and Antiquities"). A question: are objects that are circulated, bought, sold and re-sold, between dealers and collectors reevaluated each time they become available on the market? Just a thought.